Xobni, the leader in email and relationship management, has announced the Smartr Contacts (formerly Xobni for Android) for Android. It is a free app for Android that brings the relationship management to your phone. Contacts are easily searchable and Smartr ranks them by importance and not alphabetically. Each profile is complete with a photo, job title, company details, email history, common contacts and info from social networks. The app can be accessed on your phone home screen, via the main search bar, the widgets, or the Smartr app. The app is available for free over here. 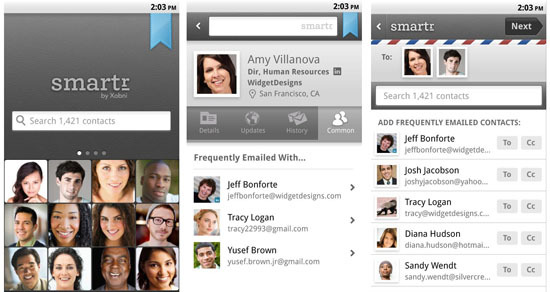 Smartr Contacts for the iPhone is in private beta and expected to hit the Apple app store in Q4.